If you need a quick and decadent appetizer idea, these Polenta Bites with Black Olive Tapenade will do the trick. Crispy polenta and tangy black olive tapenade create a mouthwatering appetizer that everyone will love. I’ve said it before and I’ll say again – I’m an appetizer person. If I could, I would eat them all day instead of the full meals. Now, you have to believe me when I said this polenta appetizer is made in no time. Being a mama of a newborn and a toddler, doesn’t give me much time for complicated recipes. Therefore, most recipes on my blog are easy to prepare. I made these Polenta Bites after I dropped my daughter off at preschool and put the little one down for a nap. And her morning naps are really short, 30-45 minutes. So, I knew I had to make something really fast. This simple appetizer combines all of my favourite ingredients. I love polenta, but I’m also a huge fan of olives, capers and anchovies that are part of this tangy tapenade. The best part is that tapenade is very versatile and goes well with your favourite crackers, veggies or anything else you could think of. 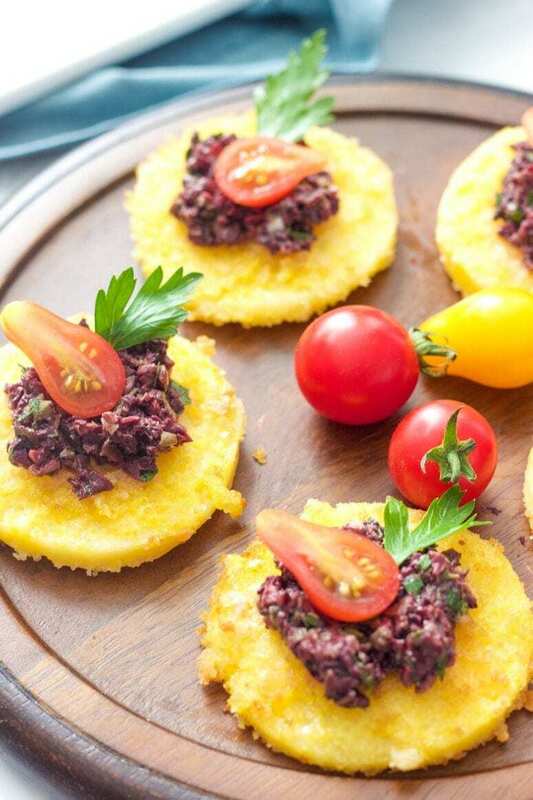 The combination of crispy polenta rounds and rich and flavourful tapenade works wonderfully together creating an appetizer that will go fast at your next party. Place bread crumbs in a shallow bowl. Press both sides of polenta slices in bread crumbs. In a large skillet, heat 3 tablespoons of oil and over medium-high heat. Add polenta and cook for 3-4 minutes on each side or until golden brown. Meanwhile, in a bowl of a standing mixer, combine olives, capers, anchovies, lemon juice, parsley, 1 clove of garlic and 1 tablespoons of olive oil. Pulse until everything is finely chopped. Arrange polenta on a serving plate, top with a teaspoonful of tapenade, garnish with tomato half and parsley leaf.